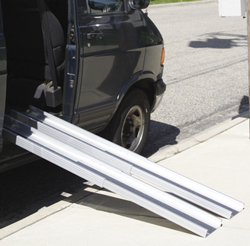 Track style wheelchair ramps are the lightest style of wheelchair ramps available but they do have some drawbacks. 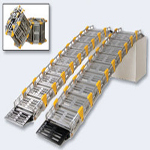 There are a couple of styles of track ramps depending on the manufacturer. Some track ramps telescope out to their full length, some are hinged in the middle cutting their length in half and some roll up into compact packages for storage and transportation. 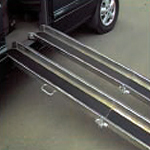 Because they are not full width they are often quite a bit lighter in weight than other types portable wheelchair ramps. One of the drawbacks of track ramps is they can sometimes be difficult to align properly on uneven terrain. If the tracks aren't very close to parallel when set up the wheelchair or 4 wheeled scooter can mat run off the edge of the tracks when in use. The wider the wheelchair ramps tracks, the less likely this is to be an issue. Another drawback is track wheelchair ramps won't work for three wheeled scooters. The front center wheel would need a track of its own. A third drawback is that if a power wheelchair or scooter is being powered up the track ramp and one of the drive wheels loses traction and spins it is possible one of the tracks may be spit out behind the mobility device causing it to fall to the ground. Because of the instability of having two tracks instead of a single platform I don't normally recommend track ramps for users to drive upon. I'd prefer to see track style wheelchair ramps used for loading and unloading unoccupied equipment unless the the rise is quite low and the danger of a fall is minimal. 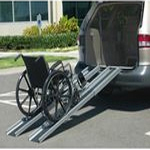 For information about choosing the right wheelchair ramp visit our web page on choosing a wheelchair ramp. Lengths Available: 3, 5, & 7 ft. or 4, 7, & 10 ft.